A Custom-Designed Microscope That Will Fit Your Needs Perfectly. The SMZ-143 offers professional-grade digital stereoscopic imaging - with an impressive features package - at an affordable price. This trinocular microscope bundle allows you to effortlessly capture hi-res digital video and still images with an easy-to-use computer interface to measure, inspect and manage every aspect of the image gathering process. The SMZ-143 is simple to operate, making it the perfect tool on quality control/ production lines, in the lab, in the classroom, or anywhere that a quality digital microscope would prove helpful. The included 2.0 Megapixel Color Camera outputs high-quality 1600 X 1280 live imaging which treats users to crisp, clear, detailed color images on your computer's monitor, with zero hassle. With the powerful Motic Images Plus package, the user is able to take still image snapshots, perform rapid live image capture, written annotation, advanced linear and geometric measuring, voiceover capability and a wide array of additional imaging enhancement capabilities. The microscope's design provides ultimate flexibility in how it is used, allowing a wide range of specimen sizes to be viewed. This trinocular bundle allows users to not only have a digital viewing option but a fully functional, stand-only microscope without a camera. Although, when it is used with its digital camera capabilities, the SMZ-143 allows users to share its vivid still and video images with co-workers, clients and/or students. The Round Universal Stand is ideal for users who frequently need to observe objects that are too large or irregularly shaped to be studied with a conventional microscope stand. This stand features a large, round base for maximum stability. 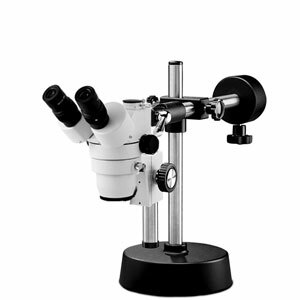 This stereo microscope comes standard with a 1:4 zoom ratio and when combined with the optional lenses the range may be changed from a minimum of 1.75x to a maximum of 180x. Each eyepiece has an adjustable diopter to compensate for visual dissimilarity between your eyes, plus interpupillary distance (IPD) adjustment to perfectly match the distance between your pupils, which ensures total viewing comfort for every user. The Single Gooseneck lighting provides users with a single cool, electronically isolated, white light that stays precisely where you place it. The Dual Gooseneck lighting provides users with two cool, electronically isolated, white lights that stays precisely where you place them. The Fluorescent Ring Light provides users with 360° of adjustable, flicker-free illumination. This is especially useful for inspection and assembly environments, and is also well suited for video and machine vision applications. The LED Ring Light provides users with 360° of adjustable, flicker-free illumination. This is especially useful for inspection and assembly environments, and is also well suited for video and machine vision applications.